It doesn't seem fair that your feet hurt from walking just 6 miles, while your friend can go twice that far without any aches or pains. Still, when your "dogs" are barking, you need a sore-foot remedy that works fast. These tried-and-true treatments address a wide spectrum of complaints, whether your feet hurt from walking long distances on the trail or from an hour or two of shopping at the mall. Foot baths are justifiably famous as the go-to solution when your feet hurt from walking. Hop into the tub if you also have sore legs after walking all day. If not, a basin that's deep enough to hold both feet is all you need for a classic foot bath. Fill either the foot basin or a bathtub with warm water. Add up to 2 tablespoons of Epsom salt for every gallon of water you're using. The magnesium and sulfate in Epsom salt have anti-inflammatory and pain-killing properties. As a bonus, the salts can also treat any foot fungus, toenail fungus or ingrown nail infection that might be exacerbating your foot pain. A topical gel or cream provides quicker relief than many oral painkillers because they're applied exactly where the aches and pains occur. Products containing natural ingredients abound. One class of topical gels, containing a compound from cayenne pepper, blocks pain signals from the brain. Another includes eucalyptus, menthol or turpentine oils to disrupt nerve symptoms. A third type contains salicylic acid, a natural ingredient similar to aspirin, to provide targeted pain relief. Topical preparations also give you portable relief. Whether you're on a multiday hike or don't want to wait for relief once your day hike is over, relief is as close as your backpack. Look for topical painkillers in ointment or cream form. When your feet hurt from walking, a foot massage provides instant relief. Sit with one foot resting on the opposite thigh. Start by giving your foot an all-over, gentle massage with your fingertips. Include your toes and your heel area, along with the ball and arch. Next, go deeper. Use your knuckles and thumbs to push more deeply into the parts of your foot that bother you the most. If you also have leg pain, massage your calves while you have one leg raised onto the opposite leg. After a few minutes, repeat the process with the other foot and calf. Shoe inserts for fallen arches. These will give extra support to mitigate aches and pains, but you may also need measured-to-fit walking shoes or hiking boots for extra arch support. AARP: Do Your Feet Hurt? 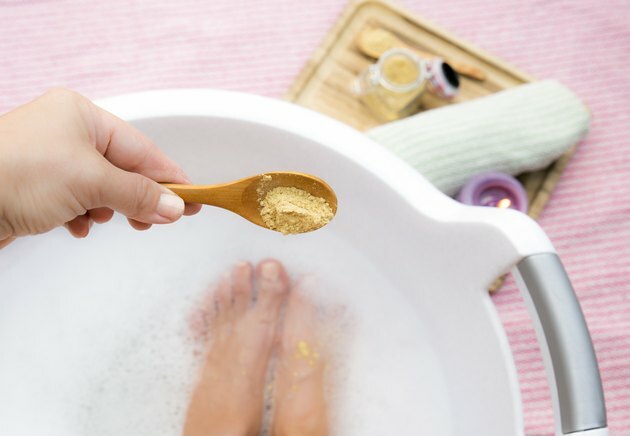 Medical News Today: What Are the Benefits of an Epsom Salt Detox?